Despite rumors of its decline recently, email has been an incredibly effective marketing strategy. In fact, email marketing has a pretty impressive return-on-investment (ROI) if done properly. A recent study by the Direct Marketing Association (DMA) and Demand Metrics described by eMarketer provided more evidence that email marketing’s ROI is still very strong. As you can see, such well-known tools as social media, direct mail, and paid search don’t even come close to email marketing’s impressive ROI of 122 percent. To achieve that ROI, however, you should do everything right. If the performance of your own email marketing campaigns wasn’t as you hoped it would be, chances are you’ve been making some mistakes. There are so many of them that marketers commit every day… If there weren’t, you wouldn’t be here reading this article. Anyway, if you want to know the most common mistakes in email marketing as well as the ways to avoid them, have a look at the following list. I’ve compiled it so you know what to avoid to maximize the effectiveness of your email marketing. Have you been sending emails just for the sake of it? Or maybe your boss expects you to email your subscribers twice a week and you do so even without having something meaningful to say? If the answer to both of these questions is yes, then you’re just bothering your subscribers. 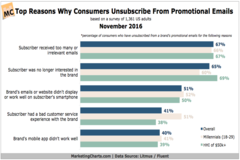 Unfortunately, there are many online businesses doing this horrible thing, because a recent survey of U.S. adults conducted by Fluent and Litmus discovered that receiving “too many” emails was the top reason why people unsubscribed from newsletters and other promotional email programs. So the takeaway here is pretty clear: sending too many emails is bad (you’ll find out how many to send in the next section), but sending too many emails without a purpose is even worse. That’s why your emails should always have a goal, such as driving traffic to a website, increasing the number of subscribers, reducing cart abandonment rate etc. Many marketers make a mistake of emailing their subscribers too often in an attempt to get as much information to them as possible. However, the outcome of the vast majority of these cases is the same: a reduced interest in the brand and an ultimate one-ticket journey to the spam folder. Since we don’t want your business to earn a reputation of a spammer, you should take a smart approach to the frequency of sending emails by performing a bit of research. As you can see in the image, 54 percent of the customers sent 2-4 emails a month. So, the optimal number of emails should be 2-4, which means a weekly newsletter or campaign. Of course, this may not apply to businesses that organize sales twice a week (customers love sales! ), but if your subscribers are collegestudents looking to get a reliable review of essay writing services, then it would be a good idea to reduce the number of emails to 4 or less. Subject line is the first thing that the subscriber sees, so nailing that first impression is critical to persuading them to open your emails. Many people judge email content based on the subject lines. In fact, the State of B2B Email Marketing report using insights from 1,000 online companies found that 47 percent of recipients opened emails based solely on the subject line. So, you have to avoid poor subject lines in your emails. Here’s the list of the worst practices. Including Emojis. That doesn’t make you look like a serious business. WeiRD SpellING. Although this trick is effective at grabbing attention, it comes across as a bit aggressive and juvenile. Promising to solve all problems of recipients. It’s recommended to promise only what you can deliver. The faux reply. Creating a subject line with Re: in it could be frustrating and misleading to the person receiving the email. They can scroll down and discover that they have no history of communicating with you, so this will make them realize that you’re using tricks to get their attention. Not good for your image. Do you open a lot of emails on your mobile device? If you do, you’re not alone. In fact, 55 percent of emails are now opened on a mobile device, reports Media Post. This represents a 29 percent increase since 2012. While many email campaigns are optimized to meet the needs of mobile users, there’s still room for improvement. As the aforementioned State of B2B Email Marketing report claimed, out of 4,500 email campaigns analyzed, nearly 1 in 5 weren’t optimized for mobile devices. This translates into 18 percent of B2B email campaigns which are NOT mobile-friendly. To define how many CTAs you should use for your own campaign, we’ll use State of B2B Email Marketing once again. According to the document, the number of CTAs in email marketing campaigns used by businesses varies. Since there’s no universal formula when it comes to CTAs in emails, experimenting with different numbers is typically recommended. However, as you can see from the data in the image above, most businesses prefer to include between 2 and 5 CTAs. So experimenting within these numbers is a good idea. Besides, you should be aware that the more CTAs you use, the more aggressive and pushy your emails may be perceived by the recipients. Now you know 5 cardinal sins of email marketing that ended oh-so-many campaigns prematurely. Hope you’ll be able to avoid them in your own strategy and get that impressive ROI email marketers are talking about. So, its time to analyze what you’re doing wrong and fix it. Happy email marketing!